A section of a global map shows areas of high mortality risk from natural disasters in Africa and southern Europe and Asia. 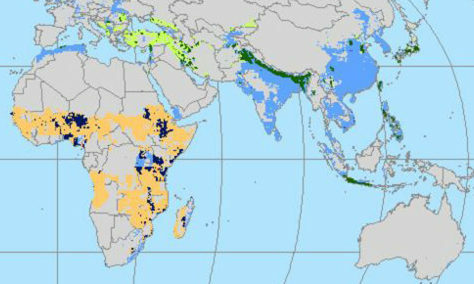 Orange indicates drought risk; blue indicates risk from floods and storms; green indicates geophysical risks such as earthquakes, volcanoes and landslides; black areas face a combination of risks. Click on links in the story below to see full maps.